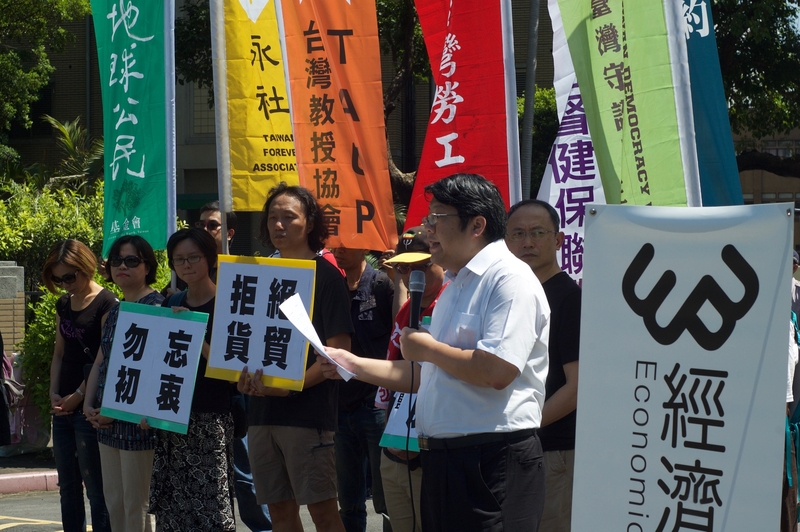 Lai and the EDU demand that the Cabinet withdraw the Cross-Strait Trade in Services Agreement from the Legislature and refuse to sign a trade in goods pact. TAIPEI, Taiwan — Civic groups protested outside the Executive Yuan on Monday, calling on the new government to reject any notions of signing trade in goods and services agreements with mainland China. The Economic Democracy Union (EDU), an umbrella group made up of labor, human rights and teachers’ unions and associations, shouted slogans and warned Premier Lin Chuan (林全) against committing the same mistakes as his Ma administration predecessors, who signed such trade and regional economic pacts as the Trans-Pacific Partnership and the Regional Comprehensive Economic Partnership (RCEP). Lai Chung-chiang (賴中強), an EDU leader, criticized the current administration for its support of the China-led RCEP, which he said would increase the vulnerability of Taiwan’s industries to mainland competitors. Lai and the EDU demanded that the Cabinet withdraw the Cross-Strait Trade in Services Agreement (CSTSA) from the Legislature and refuse to sign a trade in goods pact. The CSTSA is currently idle, in part because of lawmaker demands that the Cross-Strait Agreement Supervisory Act be passed first. The trade in goods pact underwent 12 rounds of negotiations before the Tsai administration took power last month.